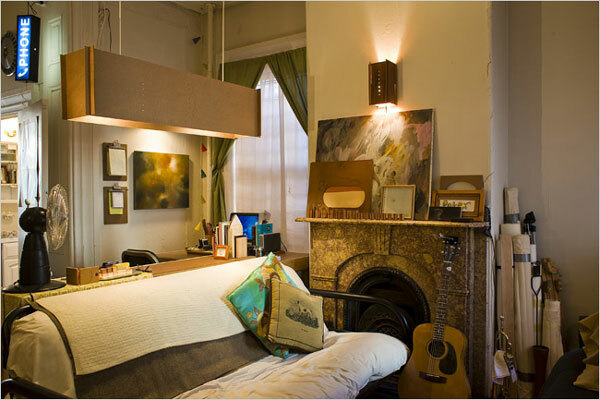 Art and architecture students produce creative DIY interiors on small budgets in NYC. For details see the NYT article. A wire cloud sculpture; a kitchen table made easily from a wood slab and tube legs from Home Depot; hanging wood light fixture made from ply offcuts; small space made larger via a loft bed and storage steps, with a desk surface made by resting a wood slab on two filing cabinets; spare paint used for wall decoration; spectacular chandelier made from plastic bags; kitchen cabinet made with a jigsaw and waste plywood. This entry was posted on Thursday, November 6th, 2008 at 2:03 pm	and is filed under art, design, DIY, furniture, interiors. You can follow any responses to this entry through the RSS 2.0 feed. You can leave a response, or trackback from your own site.